Slip and fall cases often involve spilled substances that leave floors slippery. 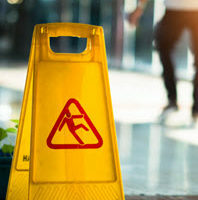 In fact, Florida has a specific statute that addresses premises liability for “transitory foreign substances in a business establishment” – that is, stuff that spills on the floor that causes people to fall and be injured. Recently, Florida’s Third District Court of Appeal ruled for the defendant in a case in which a woman slipped and fell on a detergent spill at Publix Super Markets because of the short duration of the spill. The condition occurred with regularity and therefore was foreseeable. Caridad Dominguez slipped and fell on a laundry detergent spill in a Publix store. A video recording of the aisle where she fell showed that a store manager was examining shelves at the opposite end of the aisle when the detergent bottle fell. When he heard the crash, the manager ran to the spill. The video shows that he righted the bottle nine seconds after it fell. Four seconds later, before the manager could clean the spill, Dominguez turned into the aisle and fell on the spilled detergent. The manager’s back was to Dominguez when she entered the aisle. Altogether, from the spill to Dominguez’s fall, thirteen seconds elapsed. The court noted that Publix did not breach its duty to warn of nonobvious hazards because the spill in question was obvious. Rather, the court considered whether Publix had breached its duty to maintain the premises in a reasonably safe condition. Based on the fact that mere seconds had passed before a manager began to remedy the situation and Dominguez fell, the court held that Publix was not negligent and therefore not liable. Shoppers and patrons do not expect to be injured because of unsafe conditions at the premises of the business they frequent, but it happens all too often. If it happens to you, the experienced, dedicated West Palm Beach premises liability lawyers of Lesser, Lesser, Landy & Smith, PLLC, can help you obtain compensation for your injuries. Contact us for a consultation about your case today.